It’s that time of year again! As the post-Thanksgiving food coma fades and we all realize that the holiday season is upon us, everyone turns to picking out the perfect holiday presents for friends, family, and white elephant gift exchanges. As you do, we’d love to remind you that if you shop at https://smile.amazon.com/ch/27-3490023 , Amazon donates a portion of eligible purchases to FamiLAB. It’s an easy way to help support our community this winter season (and especially on Cyber Monday)! Support us when you shop on Cyber Monday! It’s also almost #GivingTuesday , a global day of giving to non-profit organizations large and small. 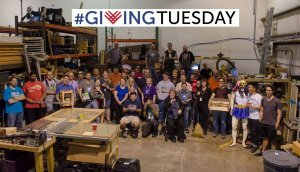 FamiLAB is a 501(c)3 non-profit hackerspace. Donations are tax-deductible and go towards awesome new classes, events, and tools which help us share knowledge and create amazing things. This #GivingTuesday, November 27th, Facebook and PayPal are matching donations to non-profits, giving you a chance to make double the impact! See our fundraiser on Facebook to donate. If Facebook’s not your thing, you can also donate here with the PayPal Giving Fund. Donations to FamiLAB will go towards our day-to-day costs (rent, utilities, etc.) so that we can continue to offer classes, workshops, and a great place in which to meet other makers, learn new skills, and wield your imagination. Every contribution, be it $5 or $500, helps us in our mission, and we’re thankful for your generosity!